With so many tools for managing social media it’s hard for someone new to the game to know where to start. After years of doing this intensively, here are my top go-to tools, listed by the job each one gets done. I’m a recovering web designer and have used Adobe Photoshop since 1997, so it’s my main tool of choice–when I’m at my desktop. But if you’re looking to create simple graphics quickly for social media posts then Canva is a great alternative. I also use Over for creating simple graphics with text when I’m working on mobile, and occasionally Pablo from Buffer. For quickly modifying screenshots, perhaps writing on it and such, I still love Skitch but ever since Evernote discontinued support for it I’ve been on the lookout for a replacement. 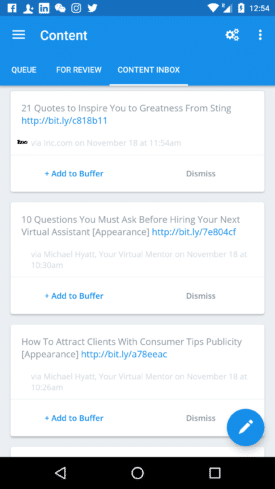 By far my favorite tool for content curation is Buffer. I use the content inbox feature a lot. I’ve already set up RSS feeds there that pull in content from sources I like, and then I fill up my buffer from there. I’m also a fan of Feedly and Nuzzel for discovering new content to share. On Instagram I’m a big fan of the Repost app. It does what a retweet does natively on Twitter, but since Instagram doesn’t allow you to repost what others have posted (c’mon guys, this would be huge for engagement on Instagram!) there’s an opportunity for someone else to create an app that does it for you. When you repost something from someone else it gives you the option to include a little badge showing who you’ve reposted it from. I do this and also tag the person I’m reposting from to give credit where credit is due. Regardless of the source of the content, once I find something to share it almost always goes into Buffer for scheduling. This is especially necessary for me for Twitter, because I live in China but there is virtually no audience in China for Twitter, since it’s blocked. That means most of my audience is awake while I’m sleeping, and vice versa, so the content I post would be completely missed if I posted while I was awake. That means most of the time, when I want to post content to Twitter, I post to Buffer and then Buffer posts for me while I’m sleeping. The except to Buffer for scheduling content is MeetEdgar, which solves a different issue I have. Since I’m constantly attracting new followers who haven’t seen my past content, and because so many of my followers don’t see my content either because of timing or because it gets lost in the feeds on Facebook and Twitter, I use MeetEdgar to repeatedly post my content over and over again. That may sound annoying, but consider that the vast majority of my followers never see anything I post because organic reach on Facebook and Twitter is so low. Plus, I have a lot of content, so it takes a long time before the same thing repeats itself. It’s unlikely many of my followers ever see the same content posted twice, so I get more exposure, save a ton of time, and nobody gets hurt. I’ve only found two ways to grow your audience on Twitter and Instagram; 1) do amazing stuff that attracts a lot of attention, and 2) follow people in the hopes they’ll follow you back. Oh yeah, or you can just buy fake followers, but that doesn’t qualify as “growing your audience” because fake followers aren’t a real audience. For growing follower counts, there are tools that will automatically follow and then unfollow profiles on Twitter and Instagram for you in order to boost how many people are following you without making the number of people you’re following grow out of control. I like the idea of doing it 100% organically and not using these tools, but in the spirit of experimentation I’ve tried out some tools and they have not only boosted my numbers, but have also led to higher engagement. The trick is to find tools you can configure in such a way that rather than just dumping large numbers of irrelevant followers on your doorstep, they do what you would do manually if you had the time, that is, they follow a specific audience that is likely to be interested in following you. Tweepi is not a tool for automating anything–you’re the one in control. But it sure speeds up things on Twitter like following large numbers of people. 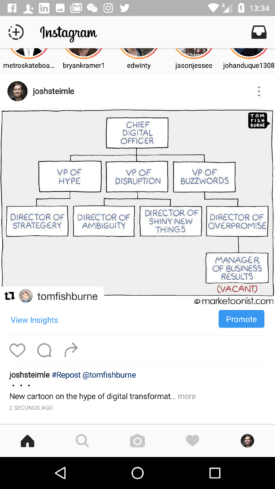 For example, let’s say you want to get in with the chief marketing officer (CMO) crowd on Twitter. 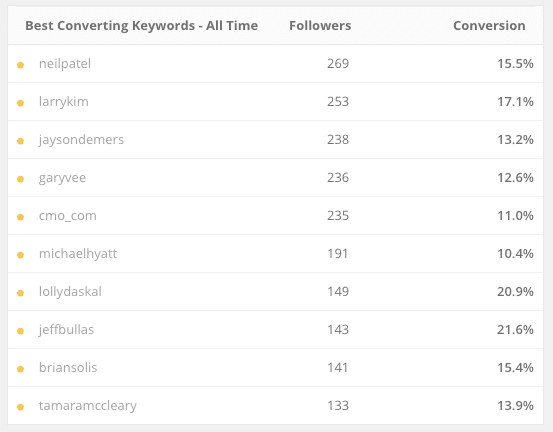 You could do a search for profiles that match “cmo” on Twitter and spend hours to follow a few hundred of them, or you can find a list of CMOs on Twitter, pull that into Tweepi, and then follow 1,000 CMOs in a matter of minutes. 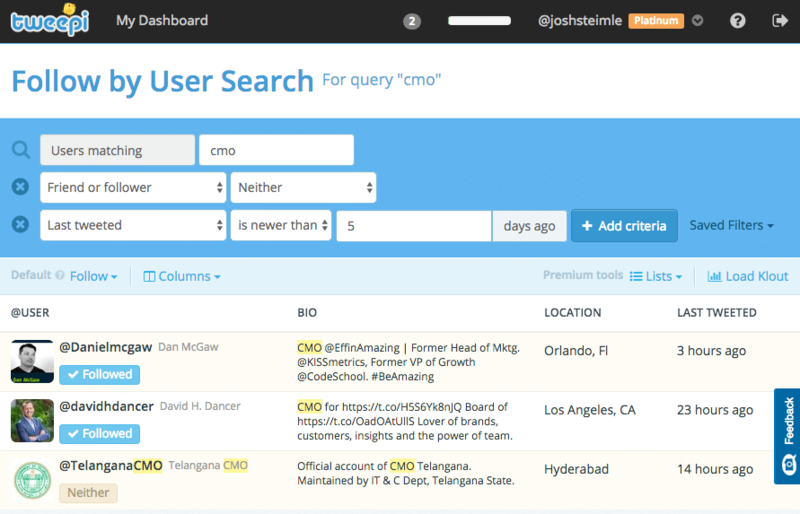 You can also do searches by keywords in bios and in other ways, and then follow whoever matches your criteria quickly. Crowdfire a simple app for seeing who you’re following who is not following you, who has unfollowed you recently, etc. Good for quickly trimming who you’re following on Twitter and Instagram. This is an interesting one. You tell SocialQuant what Twitter profiles you like, and SQ follows/unfollows followers of those profiles. So if you think you’re the next Gary Vaynerchuk, you put Gary V’s handle in SQ, and it starts following his followers. Of course if you’re not the next Gary V this will flop because those people will check you out and realize you’re not anyone they’re interested in, but if you’ve got a good foundation then this can help get you grow a large community of targeted and relevant followers. It then gives you useful stats to tell you whose audience is most interested in you. Like SocialQuant, except for Instagram, SociallyRich follows/unfollow profiles on Instagram for you based on who you specify. It will also do things like automatically commenting on posts based on keywords in those posts, but I find this annoying when people do it to me and I don’t want to do it to others. SociallyRich doesn’t give you any dashboard to update settings or gets stats, but it delivers targeted followers, not just junk followers, so it’s worth checking out. 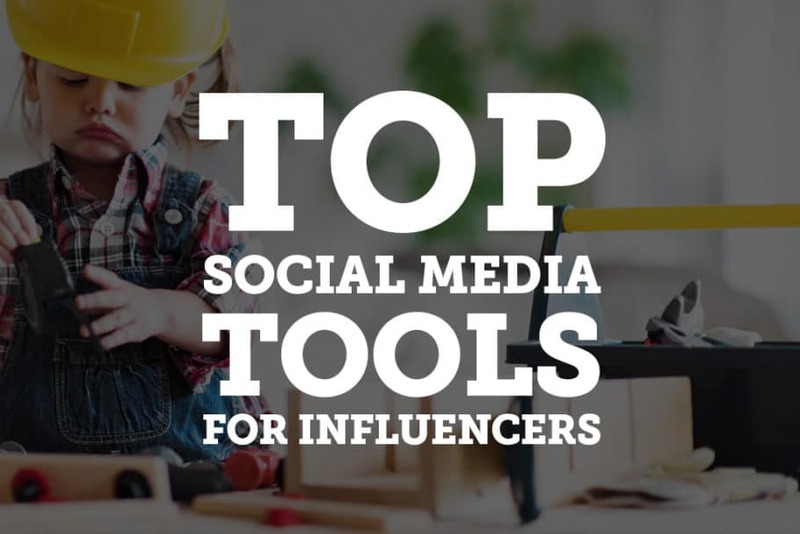 Each influencer I know has his or her own toolkit. I’m always on the lookout for new tools that will help me do my work faster and better. What tools are you using that you can’t live without? Tell us in the comments below.